I can't stop looking at these cookies. And I can't stop eating these cookies. Actually, I can, since they're all gone already. Ha! Need to make a new batch asap. 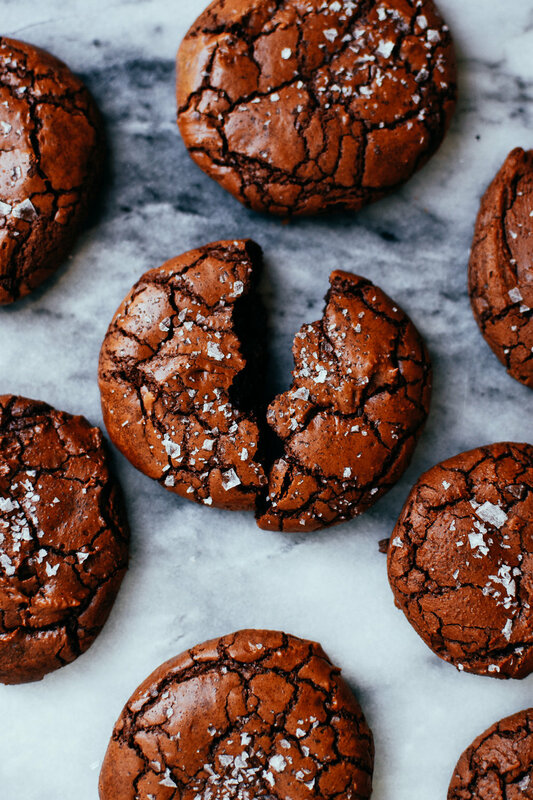 I had seen these brownie crinkle type cookies floating around the internet for a few month now, and had them on my (endlessly long) "to bake" list for a while. They're just so darn beautiful, and they looked like the dreamiest, chewy chocolate cookie ever. This recipe is very slightly adapted from Edd from The Boy Who Bakes (who you should definitely be following...duh), and they turned out exactly as I had hoped. 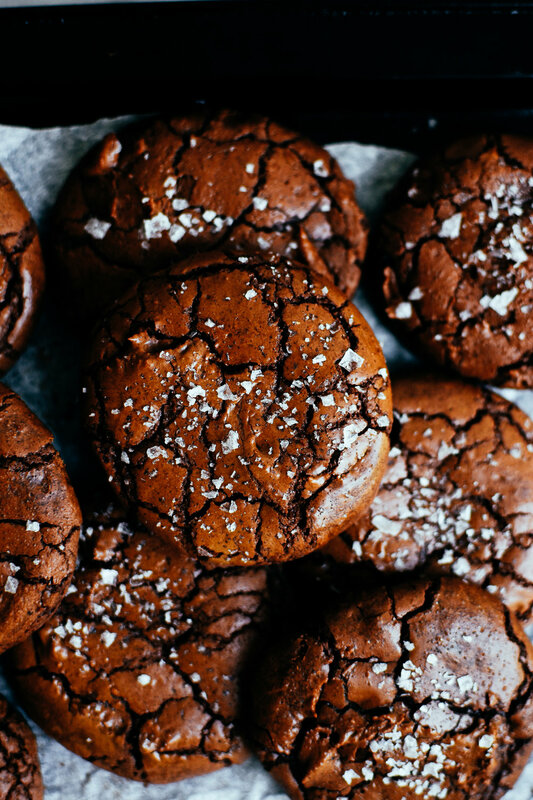 They're chocolatey, fudgey, brownie-like, and have the prettiest crackled top. Now, I won't lie, these cookies are a tiny bit fussy. But don't be scared! They're just pretty time-sensitive, and it really makes a difference if you're not prepared. So, make sure your oven is pre-heated, your pan is prepped, and all of the ingredients are measured out before you start! Edd shared all the ingredients in grams, and I've added cup conversions here. Please note that using a kitchen scale and grams is truly the best way to bake, especially with flour! Kitchen scales are super cheap, and are a life-saver in the kitchen. I've been using them more and more, and will hopefully start sharing both here on the blog! Anyhow, back to cookies. Go make these and I dare you not to eat them all yourself! *I used granulated sugar instead of caster sugar and they turned out great. *Edd says not to use "natural" cocoa powder, and to use dutch processed. My package didn't say either of those things, and they turned out wonderfully. He mentions that dutched cocoa is darker and has a more intense flavour, so I'll be on the lookout for that in the future. As stated above timing is super important for these cookies, so be sure that your oven is preheated to 350 degrees F, your baking trays are lined with parchment or silpat mats, and all of the ingredients are measured out. The batter thickens incredibly quickly, so you want to get the cookie dough onto the pans and into the oven as quickly as possible. If you have a giant pan, or can fit two pans in your oven without stacking them, then cook them all in one batch, as that's ideal for getting the best, shiny, crinkle tops. Otherwise, scoop all of the cookies immediately, and then bake the pans separately. In a small saucepan, melt the butter and chocolate together on low heat, stirring constantly. This can also be done by using a double boiler if you're worried about burning the chocolate. Once melted, set aside. In a large bowl, use the whisk attachment for your stand or hand mixer, and whisk together eggs and both sugars on medium-high for exactly 5 minutes. Reduce speed and slowly pour in chocolate mixture. Mix until combined. In a medium bowl, mix together the dry ingredients together. Switch from a whisk to a paddle attachment on your mixer, and slowly add dry ingredients to the wet. Mix until ingredients are just barely combined. Use a spatula to scrape down sides and bottom to ensure all of the ingredients are incorporated. Use an ice cream scoop, or simply a spoon, to drop large balls of dough onto your prepared pans. Now, the dough will be pretty gooey, and should look similar to brownie batter. It should be wetter than your average cookie dough, but shouldn't spread too much on your pan. Leave a few inches between each cookie as they will spread quite a bit. Sprinkle with flaked salt, and immediately place in the oven. Bake for 10-12 minutes. The cookies should come out of the oven crinkled and domed, and will collapse a bit as they cool. This makes for the fudgey, delicious centers. Allow the cookies to cool on the baking trays for at least 20 minutes since they'll be very soft and will break if you move them prematurely. These are best served slightly warm on the first day, but will keep several days in an airtight container, or for several weeks in the freezer.